The recently concluded RNLA Election Law conference held in Las Vegas had many highlights. Notable speakers included Georgia governor Nathan Deal and FEC Chairman Lee E. Goodman. Presenters discussed a wide range of issues important not only to election lawyers but to Republican lawyers of any practice. Panels included salient topics such as the Presidential Commission on Election Administration, Supreme Court cases, and recounts. Law Professor and American historian Chris DeRose recently published a new book about Abraham Lincoln and the Civil War. DeRose will attend this year’s National Election Law Seminar in Las Vegas this weekend and will host a book signing. DeRose's work has been highlighted by POLITICO, the Washington Post, the New York Times, Human Events, and numerous other publications. The Miami-Dade Police Benevolence Association is sick of vote fraud in Florida and is going to do something about it, offer a reward. In a Federal Election Commission (FEC) session last Wednesday, Republican Chairman Lee Goodman warned that the FEC could attempt to regulate book publishers under its authority to make campaign finance rules. Chairman Goodman will be a featured panelist at this year’s RNLANational Election Law Seminar. Instead of helping people vote, or take advantage of the many benefits that government ID can provide, the left instead wants to use them as examples. Whether it is Viviette Applewhite the plaintiff in the anti-ID case in Pennsylvania who obtained an ID during the trial or one of the plaintiffs in the Supreme Court case Crawford v. Marion County who actually had a Florida ID, the left is much more interested in making political points than helping voters. A new report issued by the Center for the Study of the American Electorate (CSAE) last week suggests that the upcoming election season will yield the lowest midterm primary turnout in history. National turnout in 2010 was down 18 percent for states that held statewide primaries for both major parties, reaffirming RNLA’s findings in its PCEA report that early voting has little to no tangible benefits. Anyone who had any doubts of the Democrats real goals on executing the “Nuclear Option” on judges should have no doubts now after the narrow confirmation of Pamela Harris with only 50 votes yesterday. The Democrats are trying to pack the courts. 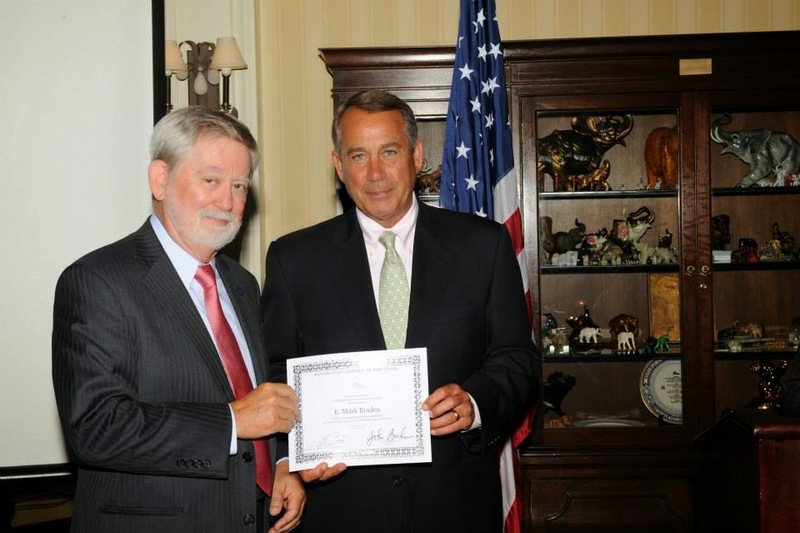 Mark Braden with the Lawyer of the Year certificate presented by Speaker John Boehner.